BRYAN EATON/Staff photo. 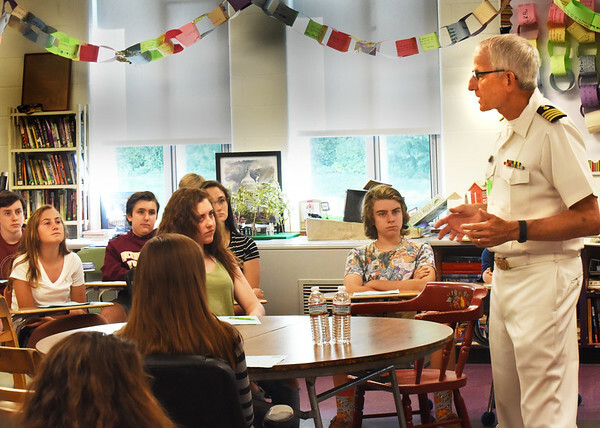 Ralph Orlando, a retired US Navy captain and medical officer who served 13 months in the Indian Ocean during the Iranian hostage crisis in the late '70s, speaks to an eighth grade class at the Nock Middle School on Wednesday. He and 10 other veterans, in a response to a general public request from Rep. Seth Moulton’s office, spoke about their military service at the Veteran Town Hall Meeting for the students on Flag Day.